Join the discussion on our forums! Come discuss Cornered Sentry over in our dedicated Cornered Sentry discussion topic. Plays Cornered Sentry => Witching Hour be like "Where did that spider go? :o"
Having run the "Guarding the Shard" deck a ton, I found this card to be a liability more often than not. If you don't have Ravaging Ghoul or Whirlwind queued up right behind it (which effectively makes this a 3 or 5-mana card) you're taking an awful risk by giving your opponent three free beast minions. There's simply too many ways they can be used against you to justify a 2/6 taunt (off the top of my head, Hunters, Priests, Druids, and Pallys can buff, Warriors can turn them into a Frothing Berserker boost-machine, Locks can sacrifice them, etc). All in all, it's a mixed blessing at the best of times, and an active detriment at worst. You're probably better off swapping it out for another, more reliable 2-cost Taunt. WHy does she say "clever girl" when she dies??? 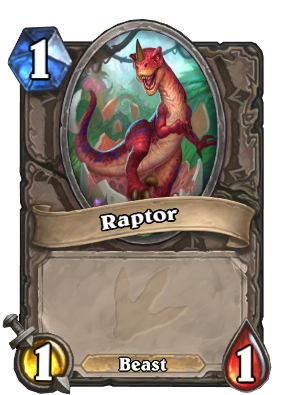 the raptor(s) are clever girls for killing her? Is she talking about herself being clever? So the Raptors generated are Beasts, huh? Yeah, don't play this against Hunter or Druid. IN that case, follow with a Whirlwind, Ravaging Ghoul, or your angst. 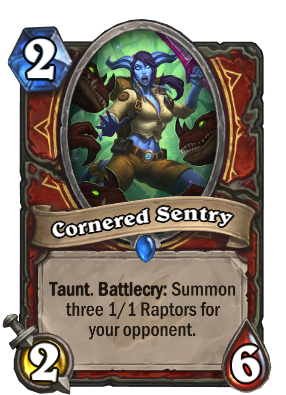 This card is better than it seems, you can play this in turn three with Whirldwind to clear the raptor (and meybe some one drops) and you still have a 2/5 Taunt on your board, plus is a cheap card to clear the quest. Death sound is "Clever girl"
I'm in love with her accent. Meh. Sounds like someone spent 5 minutes learning a Russian accent from old Bond films.